The Atherton Elementary School drumline and cheerleaders are taking their award-winning and upbeat percussion and dance routine on the road for the first time. 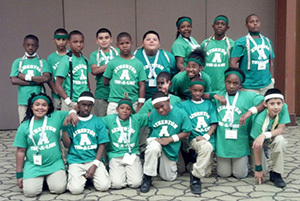 Thirty-two fourth- and fifth-grade students in the drumline and cheerleading program headed to Palm Springs, Calif., on Tuesday morning to perform at a national after-school conference called the Best of Out-of-School Time (BOOST) Conference. This is the group’s first time performing out of state, and the students are scheduled to perform Wednesday through Friday at the conference for about 2,000 attendees at the Palm Springs Convention Center. “They’re overwhelmed with excitement about getting on a plane and going to a different state to perform in front of a large crowd,” said Atherton after school coordinator Angela Allen, who will accompany the students on the trip along with Principal Dr. Albert L. Lemons and other school staff and volunteers. The students will perform various cadences with a military and college marching band style under the direction of their percussion instructor, Jeromy Maxwell. The students received a special invitation to perform at the conference after submitting a video of a past performance. Since the drumline was organized last school year at Atherton, the group has performed at Reliant Center, Houston Rockets games at Toyota Center, and at the All-American Battle of the Bands, where the group won first place in the elementary division. The drumline and cheerleading program is part of Atherton’s 21st Century After-School Programs, funded by a U.S. Department of Education grant administered through the Texas Education Agency to provide academic enrichment opportunities during non-school hours for children. The group practices after school for three hours each day Monday through Thursday. The school held multiple fundraisers to pay for air travel and hotel stay for the students. They also received donations from community churches and local businesses to fund the trip. This entry was posted in Elementary Schools and tagged Atherton ES on April 30, 2014 by HISD Communications.